And it’s May again, and I’m taking part in Me-Made-May 2016 (MMM16). I did this back in 2014, and have joined up for another year. The idea behind #MMM16 is for people to sign up and commit to wearing clothing they have made themselves during the month of May. The level of commitment is up to the individual, with the expectation that it will be at least slightly challenging. There are people who have signed up to wear 100% me-made clothing during May, and others who have committed to wearing me-mades only a few times. My own personal commitment is to wear at a me-made article of clothing at least twice per week, excluding active wear. I have quite a bit of active wear made, including my Hudson Track Pants which I wear constantly around the house, so it isn’t challenging for me if I include that. 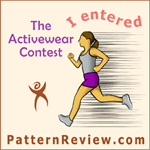 Back in 2014 the active wear was a large chunk of my me-mades that year, and this year I wanted it to be different. If you are interested in Me-Made-May 2016 you can pop over to ‘So, Zo’ and check it out. There is also a Pinterest board and Instagram. Search for the hashtag #MMM16 and you should find the entries. There is no requirement for us to post daily photos etc, although most of us are posting some. I plan to put up a blog post each week, rather than each day.